My main interest towards Firefox OS derives from the fact that it is Free Software and that it is by Mozilla, an organisation that knows about the importance of free software and that fights for an “open web”. They also don’t hide that Mozilla heavily relies on Free Software technologies. explore and prototype new use cases in the world of connected devices as an open source project with a clear focus on the user benefit and experience. I like to argue, that a clear benefit to the user experience would be to easily find and use Free Software inside Firefox OS and therewith support Mozilla’s idea of “Open Web”. With the upcoming “internet of things”, it will be crucial that the people are in control of the technology and the devices that surrounds them. 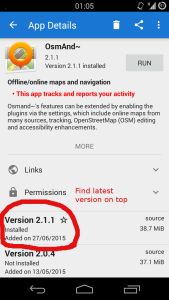 And as one simple but effective step towards that vision, I propose that Mozilla has a clearer information policy inside the Firefox OS market place. Please, add some information or label to make finding Free Software an easy thing. Make the use and the promotion of Free Software a concept inside Firefox OS, it’s market and add-ons. This would be a true benefit for the user. 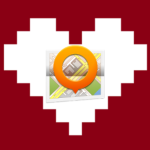 Today, like every year on Valentine’s Day, the FSFE is running its “I love Free Software” campaign: a day to show and celebrate your love for Free Software. That is why I take my chance today to thank the developers of OsmAnd for all the work they are doing! Last year in summer, I was doing a bicycle trip for some days through the northern part of Germany, especially through the Mecklenburgische Seenplatte and along the Baltic Sea. Generally, when I am on bicycle trips, I prefer to cycle aside from roads and motorways but along the paths, the hiking trails or even dirt tracks. 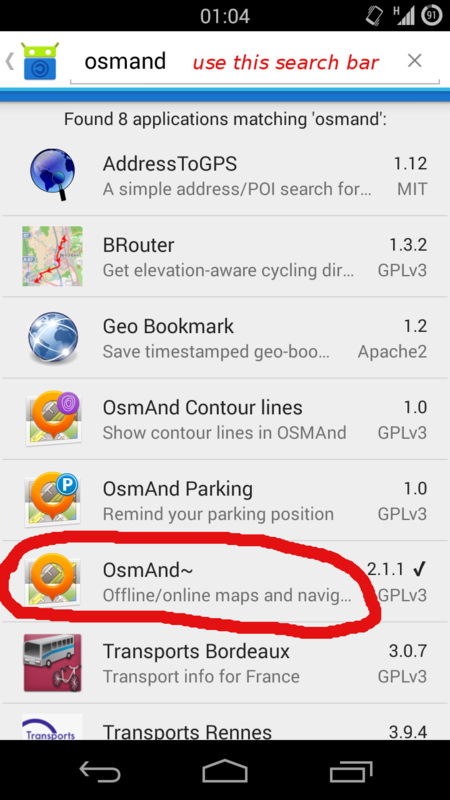 That was exactly the time, when I fell in love with OsmAnd, a maps & navigation application for Android systems. This is not just because it gives me the ability to use Free Software with really good maps for navigation. This is especially because you can download any maps of the world (as long as you have enough space to save them) whenever you like (While you are on Wifi, e.g.) and use it afterwards completely offline. 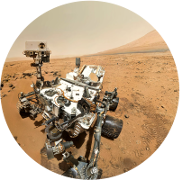 For example, when you go to some foreign country, you can download the entire map of this country before and then enjoy a complete maps&navigation system without the need of having internet access or having to pay any roaming charges for internet access. Or, like in my case, when you cycle long distances through landscape (where you miss power plugs as well as network connectivity most of the time) you can stay in flight-mode all the time and keep on cycling with navigation for days. In addition, the maps are really good and detailed and you can see even tiny hiking trails to follow. 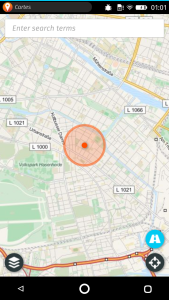 You can also set your own favorite points on the map, without having to fear that these favorite points will be send to or tracked by any server – as you are using it offline. 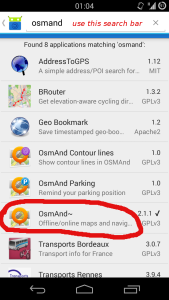 Last, but not least, you can download OsmAnd from F-droid, the Free Software App Repository, so you can use all OsmAnd features on an Android based operating system without the need of any Google account. 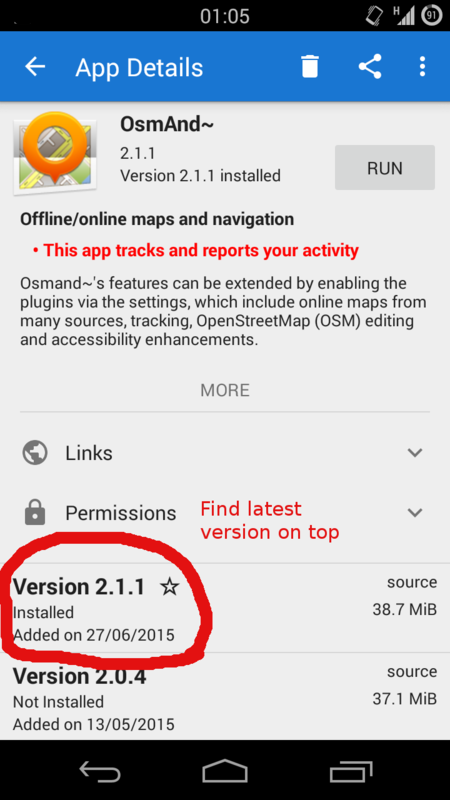 In short: Dear OsmAnd developers, thank you very much for this useful app. Keep the good work going, I love you guys!